We’d love your help. Let us know what’s wrong with this preview of Midnight Moon by Raven K. Asher. Why the chaos, well because vampires and werewolves, along with every other supernatural creature, have come out o Ava has everything that she could ever want; great supportive parents, an amazing boyfriend, and a job that’s actually not so bad. She lives in a small town where even though the world around them has been plunged into chaos it’s remained relatively untouched. 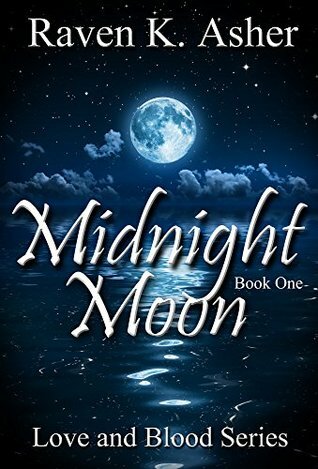 To ask other readers questions about Midnight Moon, please sign up. What if the world we knew wasn't what we thought? That is what this book starts out as, Ava a small town girl, with a loving family, a loving boyfriend, all living in a nightmare they thought were only in books. Her world is changed one night by fate and a new adventure awaits her. She meets Loki and Tobias, who take her in and show her how her new life as a vampire will be. She falls in love with not one but several men only to lose one in the end. She finds her best friend and is reunited with What if the world we knew wasn't what we thought? That is what this book starts out as, Ava a small town girl, with a loving family, a loving boyfriend, all living in a nightmare they thought were only in books. Her world is changed one night by fate and a new adventure awaits her. She meets Loki and Tobias, who take her in and show her how her new life as a vampire will be. She falls in love with not one but several men only to lose one in the end. She finds her best friend and is reunited with her as well. Through out the book she is taught how to adapt and how to overcome situations that she really did not want to deal with. I could not put this book down! I received the book as ARC to review via Booksprout. A main character of the book has to answer the question. How to be a vamp. She has been turned into a vamp against her will. But. Still she discovers love. , friendship and more humanity among vamps and other creatures of night than among humans. Great characters, reality and plot. Good story telling. Highly recommended to all vamps lovers. I have never read any story from this author Raven K. Asher before this story. She is becoming one of my favorite authors fast, cause she does what my favorite authors do she writes the stories like you are living them instead of reading them. This one was a awesome book to read cause, it has suspence and drama in the story the story is well written with strong characters. This is a quick and easy read. The storyline is well-crafted, intriguing, suspenseful, has drama and steam. The characters are defined, and likable with sizzling chemistry. I liked it. The book is a good paranormal romance read. The characters are good. The story has suspense, intrigue, paranormal, and romance. How many times can a person WHIMPER? The world may never know.